The EWS has received word from Irene Goldman-Price that Elsa Nettels passed away peacefully this morning. EWS members and her many students at William and Mary knew Elsa as a wonderful scholar, friend, and mentor, generous to younger scholars and unfailing in her guidance. Further information and a picture will be added here as available. Please feel free to leave your memories of Elsa in the comments or in the online Guestbook at http://www.legacy.com/obituaries/name/elsa-nettels-obituary?pid=1000000183260973. This entry was posted in Announcements, In Memoriam and tagged In Memoriam on December 30, 2016 by Donna Campbell. This entry was posted in Announcements on December 12, 2016 by Donna Campbell. BOSTON, MASS. — William Merritt Chase is remembered today not only as one of the great artists of his generation, but also as a gifted and engaging teacher, inspiring a generation of artists who would go on to establish America as an epicenter of Modernism in the Twentieth Century. As such, he is an essential bridge between that Modern era and the time when American art was still in its infancy. His career also encompasses a time of great change in American culture, best seen in his elegantly rendered, intellectually challenging and attention-getting portraits of women. 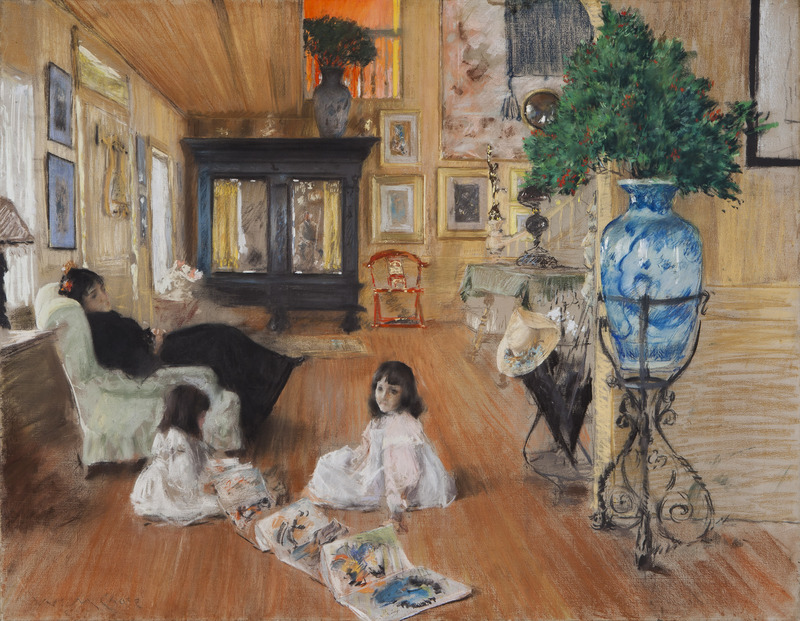 Such portraits are a highlight of “William Merritt Chase,” organized by the Phillips Collection, Boston’s Museum of Fine Arts (MFA), the Fondazione Musei Civici di Venezia and the Terra Foundation for American Art, and on view at the MFA through January 16. In Edith Wharton’s 1905 novel The House of Mirth, published while Chase was in the autumn of his career, a pivotal scene has the heroine, Lily Bart, participating in a tableau vivant. The term refers to a popular pastime of the turn of the century, in which participants posed in elaborate costumes and settings as living recreations of famous works of art. Lily, whose social standing is in jeopardy but whose beauty remains unrivaled, recreates a portrait by Joshua Reynolds, and Wharton’s elegant prose draws the reader into unguarded admiration. The scene is swathed in poetry and romance until its denouement, when Wharton’s omniscient narrator reveals the ugly way in which certain men in the audience have chosen to view her performance. William Merritt Chase was also fond of tableaux vivants. In “Old Masters Meet New Women,” her insightful essay for the exhibition catalog, MFA curator Erica E. Hirshler writes that Chase used his studios in New York City and Long Island, N.Y., to stage recreations of paintings by the Old Masters he revered. As a rule, he did not literally depict such entertainments in his paintings and pastels, but a sense of theatricality is nevertheless strong throughout his body of work. His famed 10th Street Studio in New York City was a particularly theatrical place, a frequent setting for his painted portraits and interiors. Diane Paulus of the American Repertory Theater, who provides commentary for the MFA’s mobile guide, notes that Chase’s interiors are arranged like stage sets in order to highlight particular passages or moments of action. Consider, for example, the Dows clan of OUR TIME AT FOXHOLLOW FARM: A Hudson Valley Family Remembered (Excelsior/State University of New York, $50) and the 800-acre Rhinebeck estate they intended to be “a sort of Mount Vernon on the Hudson.” The patriarch, Tracy Dows, was an avid amateur photographer, and David Byars’s book is based on the 26 private albums, dating from 1903 to the 1930s, that Dows’s daughter donated to Hudson River Heritage. There are plenty of views of the pillared mansion and its outbuildings (including the guesthouse where Thomas Wolfe wrote “Look Homeward, Angel”) as well as the elaborate spreads of pals like the Astors, who had a vaulted, Corinthian-columned indoor swimming pool, and the Dinsmores, whose guests could play golf on their nine-hole course. The text is filled with the era’s boldface names — Edith Wharton, Charles Dana Gibson, the Olmsted brothers, Alice Roosevelt Longworth — and the family’s travels took them to the era’s favorite high-end locales: the “cottages” of Newport; the exclusive resorts of Hot Springs, Va., and Jekyll Island, Ga.; the Beatrix-Farrand-designed gardens of Seal Harbor, Me. But in between the lines of the captions are stories waiting to be told. This entry was posted in Announcements, Wharton in the News and tagged Edith Wharton in the News, Wharton in the News on December 3, 2016 by Donna Campbell. It’s not just for students though – open to all! This entry was posted in Announcements on December 1, 2016 by Donna Campbell.